On Saturday I was up in Stockholm facilitating my fourth code retreat for Valtech, and my second Global Day of Code Retreat. It seemed to go very well. I tried out a few new elements, which seemed to make it go even better than the previous ones, so I thought I’d talk about them here in my blog. The first thing we changed was that we had quotas for men and women, and we were aiming for a 50/50 gender balance. About a month before the code retreat, we were fully booked, with 20 places each for men and women taken. In the end several people dropped out at the last minute, and there were slightly more men. Still, it was a much better balance than last year. I think it made for a healthier atmosphere during the day, and we encouraged more women to be active in the community generally. The second thing we changed was I didn’t require people to do Game of Life, I suggested some other code katas as alternatives. Game of Life is an excellent kata for practicing skills like writing clean code, simple design, and TDD generally. It’s also really fun to be doing an excercise that thousands of other programmers are also working on. However, I realized that around 1/3 of the people who’d signed up for the event had already been to a previous code retreat, and might be getting bored with Game of Life. We’re there to have fun, after all! People seemed to generally appreciate having a choice. Some pairs chose a String Calculator for their first couple of sessions, to get used to TDD, then went on to Game of Life for the others. Some pairs tried out Tennis, Gilded Rose and Tyre Pressure in the afternoon, instead of one of the other challenges. Some pairs who were already good at TDD tried out String Calculator in Clojure, and found it let them concentrate on the learning the language not solving the problem. One person, (who has been to 3 code retreats previously), didn’t do Game of Life all day, and said he really enjoyed himself and learnt loads! The third thing we changed was that I suggested people try cyber-dojo as a coding environment. This is a tool designed by Jon Jagger as an aid to practicing your coding skills. It provides a basic editor/testing environment, and records the state of the code every time you run the tests. You can review all your changes in the session retrospective, and get a picture of how well your TDD was going. Before the code retreat, I had set up cyber dojos for Game of Life, and Tennis. I put up the cyber-dojo ids on the whiteboard, and through the day most of the pairs tried it out for one or more sessions. As a facilitator, I found it really helpful when going up to a pair, to be able to see the little row of traffic light symbols at the top of their screen. I could quickly get an overview of how their session was going. 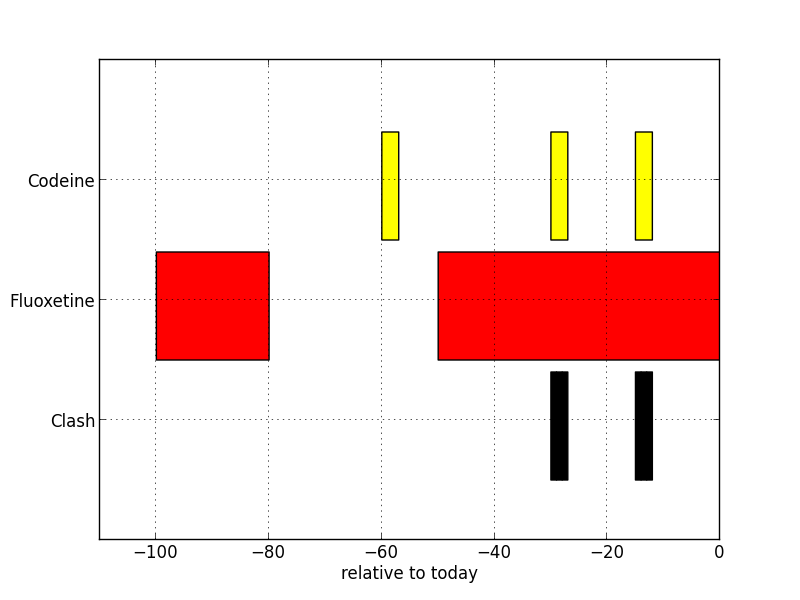 For example, if I see a few red-green-yellow sequences then I can infer they are probably doing ok at TDD. If I can see nothing bug a long string of yellow, then I know they’re in trouble! For the pairs, some liked cyber-dojo because it meant they didn’t waste any time setting up their coding environment at the start of the session. For those doing Tennis, if they made a refactoring mistake, they could very easily just click on the most recent green traffic light to revert back to a known good state, and practice doing the refactoring again. Some pairs found it helpful in the retrospective to review their session in the tool. Other pairs didn’t get on so well with cyber-dojo. Some couldn’t live without their usual editor commands. Some got confused by the lack of syntax highlighting. A couple found a bug in cyber-dojo that it lost touch with the server and stopped updating their test results, whatever they did to the code. (The workaround is to open the same url in a new window, btw). I know Jon is aware of this bug, and I’m sure he’ll track it down, but actually the lack of syntax highlighting and editor commands is deliberate. It’s the same idea as the other challenges, like mute pairing etc – to throw you out of your comfort zone and make you really concentrate on the way you code. So that was the three things we changed – gender balance, other katas, cyber-dojo. What we didn’t change was the overall format or aims of the day. We still paired for 5 sessions of 45 minutes, and threw away the code afterwards. We still had coding challenges like “Mute pairing with find the loophole” and “Maximum 4 line methods”, and held retrospectives after every session. I think deliberate practice in a group is at the core of what makes Code Retreat (and coding dojos!) fun and valuable. The changes we introduced were all designed to enhance the learning experience, and were based on experience and reflection after previous events. Overall I was very pleased with all the changes we introduced, and I’d like to do it like that again. If you’re facilitating or organizing a code retreat, perhaps you’d like to introduce some of these elements too. Posted by Emily Bache on 2012-12-10 at 17:23 under Experience Report. This Code Kata is included in my new book “The Coding Dojo Handbook”, currently published as a work-in-progress on LeanPub.com. You can also download starting code and these instructions from my github page. So that I can alert their doctors and get their prescriptions changed. Health Insurance companies don’t always get such good press, but in this case, they actually do have your best interests at heart. Some medicines interact in unfortunate ways when they get into your body at the same time, and your doctor isn’t always alert enough to spot the clash when writing your prescriptions. Sometimes, medicine interactions are only identified years after the medicines become widely used, and your doctor might not be completely up to date. Your Health Insurer certainly wants you to stay healthy, so discovering a customers has a medicine clash and getting it corrected is good for business, and good for you! For this Kata, you have a recently discovered medicine clash, and you want to look through a database of patient medicine and prescription records, to find if any need to be alerted to the problem. 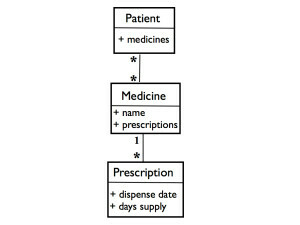 Create a “Patient” class, with a method “Clash” that takes as arguments a list of medicines, and how many days before today to consider, (defaults to the last 90 days). It should return a collection of days on which all the medicines were being taken during this time. 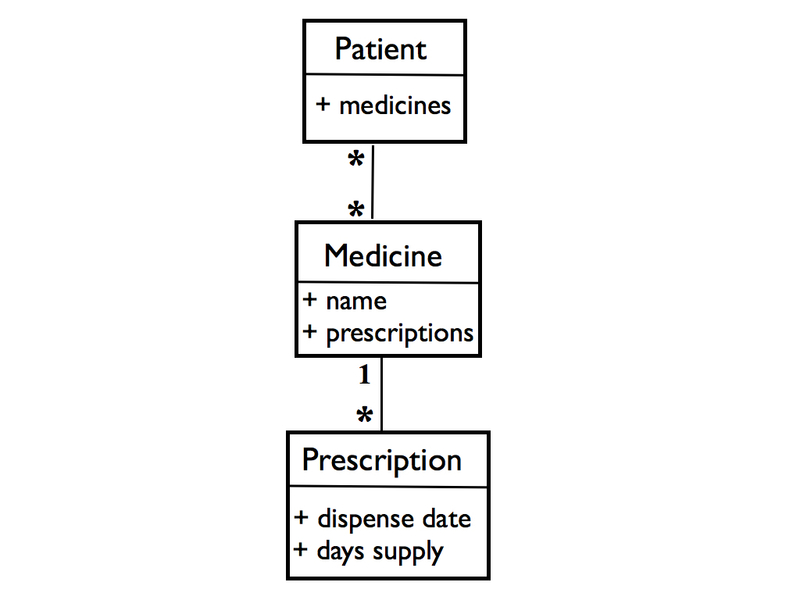 In words, this shows that each Patient has a list of Medicines. Each Medicine has a list of Prescriptions. Each Prescription has a dispense date and a number of days supply. Patients start taking the medicine on the dispense date. The “days supply” tells you how many days they continue to take the medicine after the dispense date. If they have two overlapping prescriptions for the same medicine, they stop taking the earlier one. Imagine they have mislaid the medicine they got from the first prescription when they start on the second prescription. Then you might be interested in reviewing the sample solution I’ve put up on my github page. I find this code interesting because it is seemingly well written. The methods are short with thought-through names, and there are lots of unit tests. I also find it very difficult to follow. What do you think? When you take a pill of medicine, the active substance will be absorbed through the lining of the gut, and enter your bloodstream. That means it will be taken all over your body, and can do its work. For example, if you take a headache pill, the active substance in the drug will be taken by your blood to where it can block your pain receptors. At the same time, there are enzymes at work in your liver, which break down medicinal substances they find in your bloodstream. Eventually all the medicine will be removed, so you have to take another pill if you want the effects to continue. In the liver, there are several different enzymes working, and they are specialized in breaking down different substances. For example, the “CYP 2C9” enzyme will break down ibuprofen, the active ingredient in many headache pills. The trouble is, there are other medicines which will stop particular enzymes from doing their work, which can lead to an overdose or other ill effects. One example is the clash between fluoxetine and codeine. Fluoxetine is known by its trade name “Prozac”, and is often taken for depression. Codeine is another ingredient used in headache pills, and is actually a “pro-drug”, so it works slightly differently. Codeine needs to be broken down in the liver by the enzyme “CYP 2D6” into the active substance, morphine, before it will do anything. Fluoxetine has the effect of blocking “CYP 2D6”, so if you take the two medicines together, you won’t get much painkilling effect from the codeine. That could be depressing! The solution to the problem is to take a different painkiller – one that’s not affected by that liver enzyme. Simply switch codeine for ibuprofen, and you should be be a little happier. Posted by Emily Bache on 2012-11-15 at 10:19 under Code Kata, Coding Skills. Comments Off on Introducing a Code Kata: Medicine Clash. In my last post I discussed some exercises put together by Luca Minudel. He was using them as part of a study into how developer’s skill at removing SOLID violations was related to their skill at TDD. I initially did the exercises in Java, then translated them into Python so we could look at them in our local Python User Group meeting last week. What follows are my own opinions, but I must thank all the pythonistas who were at the meeting, and Andrew Dalke who couldn’t be there but was kind enough to share his opinions and code anyway. What I write below owes a lot to their input. I’m so lucky to be in this community! We found that in Python, some violations of the Open-Closed Principle are much easier to handle than in Java or C#. You can monkeypatch, and exploit the fact that data is only private by convention. The advantage of being able to get code under test without changing it is of course that you reduce the need for risky refactorings where you unintentionally break the code and get no failing tests to alert you to it. the face of refactoring – we’d rather the test only relied on the public interface. These tests also use hard coded numbers where it’s not obvious why those values are chosen – another sign the production code could be improved. Similarly in the HTMLConverter example, there is a violation of the Open-Closed principle that makes it awkward to have the code read from a string instead of a file. One way to get it under test initially is to use monkeypatching. You just pass in a different implementation of the “open” method that doesn’t in fact open a file, but rather provides a file-like object constructed from a string. Since we have duck typing, the production code doesn’t notice the substitution. You do have to be careful to put the “open” method back to normal at the end of the test though, or the test will have side effects. # unfortunately this next line is being mangled by my syntax highlighter. assert "text to convert <>&"
Again you can quickly get some tests in place, at the cost of a test that is somewhat awkward to read. The other way to get the code under test without changing it is the same as for C# or Java – put the text in a temporary file that is deleted afterwards. This may be simpler to understand, but will be slower to execute. It’s a tradeoff. I guess the thing with these exercises is that you can get them under test in various ways without correcting the SOLID violations, or the other problems in the code. The idea is that skilled developers will not leave it at that. They will listen to the feedback the tests give them about the code being unecessarily hard to test, and respond by improving the design. Posted by Emily Bache on 2012-09-21 at 08:56 under Coding Skills. Comments Off on SOLID exercises in Python. For a little while now I’ve been collecting Refactoring Kata exercises in a github repo, (you’re welcome to clone it and try them out). I’ve recently facilitated working on some of these katas at various coding dojo meetings, and participants seem to have enjoyed doing them. I usually give a short introduction about the aims of the dojo and the refactoring skills we’re focusing on, then we split into pairs and work on one of these Refactoring Katas for a fixed timebox. Afterwards we compare designs and discuss what we’ve learnt in a short retrospective. It’s satisfying to take a piece of ugly code and after only an hour or so make it into something much more readable, flexible, and significantly smaller. Test Driven Development is a multifaceted skill, and one aspect is the ability to improve a design incrementally, applying simple refactorings one at a time until they add up to a significant design improvement. I’ve noticed in these dojo meetings that some pairs do better than others at refactoring in small steps. I can of course stand behind them and coach to some extent, but I was wondering if we could use a tool that would watch more consistently, and help pairs notice when they are refactoring poorly. I spent an hour or so doing the GildedRose refactoring kata myself in Java, and while I was doing it I had two different monitoring tools running in the background, the “Codersdojo Client” from http://content.codersdojo.org/codersdojo_client/, and “Sessions Recorder” from Industrial Logic. (This second tool is commercial and licenses cost money, but I actually got given a free license so I could try it out and review it). I wanted to see if these tools could help me to improve my refactoring skills, and whether I could use them in a coding dojo setting to help a group. The Codersdojo Client is a ruby gem that you download and install. When you want to work on a kata, you have to fiddle about a bit on the command line getting some files in the right places, (like the junit jar), then modify and run a couple of scripts. It’s not difficult if you follow the instructions and know basicly how to use the command line. You have a script running all the time you are coding, and it runs the tests every time you save a source file. The Sessions Recorder is an Eclipse plugin that you download and install in the same way as other Eclipse plugins. It puts a “record” button on your toolbar. You press “record” before you start working on the kata. When you’ve finished the kata, you need to upload your recording for analysis. With the Codersdojo Client, when you stop the script, it gives you the option of doing the upload. When that’s completed it gives you a link to a webpage, where you can fill in some metadata about the Kata and who you are. Then it takes you to a page with the full final code listing and analysis. The Sessions Recorder is similar. You press the button on the Eclipse toolbar to stop recording, and save the session in a file. Then you go to the Indutrial Logic webpage, log into your account, and go to the page where you upload your recorded Session file. You don’t have to enter any metadata, since you have an account and it remembers who you are, (you did pay for this service after all!) It then takes you to a page of analysis. It’s showing how long you spent between saving the file, (a “move”), and whether the tests were red or green when you saved. There is also some general statistics about how long you spent in each move, and how many modifications there were on average. It points out your three longest moves, and has links to them so you can see what you were doing in the code at those points. I think this analysis is quite helpful. I can see that I’m going no more than two or three minutes between saving the file, and usually if the tests go red I fix them quickly. Since it’s a refactoring kata I spend quite a lot of moves at the start where it’s all green, as I build up tests to cover the functionality. In the middle there is a red patch, and this is a clear sign to me that I could have done that part of the kata better. Looking over my code I was doing a major redesign and I should have done it in a better way that would have kept the tests running in the meantime. Towards the end of the kata I have another flurry of red moves, as I start adding new functionality for “Conjured” items. I tried to move into a more normal TDD red-green-refactor cycle at that point, but it actually doesn’t look like I succeeded very well from this graph. 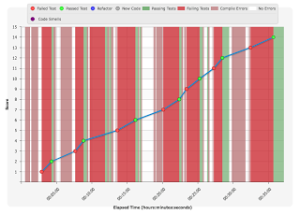 I think I rushed past the “green” step without running the tests, then did a big refactoring. It worked in the end but I think I could have done that better too. As you can see it also shows how long I spend with passing and failing tests, in a slightly different way from the Codersdojo Client’s graph. It also distinguishes compiler errors from failing tests, (pink vs red). This graph also clearly shows the areas I need to improve – the long pink patch in the middle where I do a major redesign in too large a step, and at the red bit at the end when I’m not doing TDD all that well. (This is just some of the events, to show you the kinds of things this picks up on.) “New Green Test” seems to score zero points, which is a bit disappointing, but adding a failing test gets a point, and so does making it pass. “Went green, but broke other tests” gets zero points. It’s clearly designed to help me successfully complete red-green-refactor cycles, not reward me for adding test coverage to existing code, then refactoring it. This graph has mouseover texts so when you hover over a red dot, it shows all the compilation errors you had at that point, and if you hover over a green dot it tells you which tests were passing. It also distinguishes “compler errors” from a “compiler rash”. The difference is that a “compiler rash” is a more serious compilation problem, that affects several files. You can clearly see from this graph that the first part of the kata I was building up the test coverage, then just leaning on these tests and refactoring for the rest. It hasn’t noticed that I had two @Ignore ‘d tests until the last few minutes though. (I added failing tests for Conjured Items near the start then left them until I had the design suitably refactored near the end). I actually found this graph quite hard to use to work out what I need to improve on. 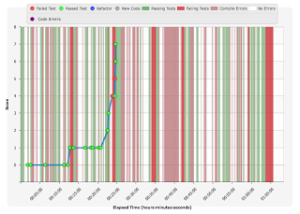 There seem to be three long gaps in the middle, full of compilation errors where I wasn’t running the tests. Unlike with the Codersdojo Client, there isn’t a link to the actual code changes I was making at those points. I’m having trouble working out just from the compiler errors what I should have been doing differently. I think one of these gaps is the same major redesign I could see clearly in the Codersdojo Client graph as a too big step, but I’m not so sure what the other two are. There are further statistics and analysis as well. There is a section for “code smells” but it claims not to have found any. The code I started with should qualify as smelly, surely? Not sure why it hasn’t picked up on that. I think both tools could help me to become better at Test Driven Development, and could be useful in a dojo setting. I can imagine pairs comparing their graphs after completing the kata, discussing how they handled the refactoring steps, and where the design ended up. Pairs could swap computers and look through someone else’s statistics to get some comparison with their own. The Codersdojo Client is free to use, and works with a large number of programming languages, and any editor. You do have to be comfortable with the command line though. The Sessions Recorder tool only supports Java and C# via Eclipse. It has more detailed analysis, but for this Refactoring Kata I don’t think it was as helpful as it could have been. The other big difference between the tools is about openness. The Sessions Recorder keeps your analysis private to you, and if you want to discuss your performance, it lets you do so with the designers of the tool via a “comment on this page” function. I havn’t tried that out yet so I’m not sure how it works, that is, whether you get feedback from a real person as well as the tool. The Codersdojo Client also lets you keep your analysis private if you want, but in addition lets you publish your Kata performance for general review, as I have done. You can share your desire for feedback on twitter, g+ or facebook. People can go in and comment on specific lines of code and make suggestions. That wouldn’t be so needed during a dojo meeting, but might be useful if you were working alone. Posted by Emily Bache on 2012-08-16 at 10:34 under Review. I think the coding community could really do with more people who know how to do TDD and think about good design, so I’m generally pretty encouraged by the success of this event. I do feel a bit disappointed about some aspects of the day though, and this post is my attempt to outline what I think could be improved. I spent most of the Global Day of Code Retreat walking around looking over people’s shoulders and giving them feedback on the state of their code and tests. I noticed that very few pairs got anywhere close to solving the problem before they deleted the code at the end of each 45 minute session. Corey says that this is very much by design. You know you don’t have time to solve the problem, so you can de-stress: no-one will demand delivery of anything. You can concentrate on just writing good tests and code. In between coding sessions, I spent quite a lot of effort reminding people about simple design, SOLID principles, and how to do TDD (in terms of states and moves). Unfortunately I found people rarely wrote enough code for any of these ideas to really be applicable, and TDD wan’t always helping people. I saw a lot of solutions that started with the “Cell” class, that had an x and y coordinate, and a boolean to say whether it was alive or not. Then people tended to add a “void tick(int liveNeighbourCount)” method, and start to implement code that would follow the four rules of Conway’s Game of Life to work out if the cell should flip the state of its boolean or not. At some point they would create a “World” class that would hold all the cells, and “tick()” them. Or some variant of that. Then, (generally when the 45 minutes were running out), people started trying to find a data structure to hold the cells in, and some way to find out which were neighbours with each other. Not many questioned whether they actually needed a Cell class in the first place. Everyone at the code retreat deleted their code afterwards, of course, but you can see an example of a variant on this kind of design by Ryan Bigg here (a work in progress, he has a screencast too). Of course, as facilitator I spent a fair amount of time trying to ask the kind of questions that would push people to reevaluate their approach. I had partial success, I guess. Overall though, I came away feeling a bit disillusioned, and wanting to improve my facilitation so that people would learn more about using TDD to actually solve problems. At the final retrospective of the day, everyone seemed to be very positive about the event, and most people said they learnt more about pair programming, TDD, and the language and tools they were working with. We all had fun. (If you read Swedish, Peter Lind wrote up the retrospective in Valtech’s blog) This is great, but could we tweak the format to encourage even more learning? I think to solve Conway’s Game of Life adequately, you need to find a good datastructure to represent the cells, and an efficient algorithm to “tick” to the next generation. Just having well named classes and methods, although a good idea, probably won’t be enough. I felt that most of the coders at the code retreat were messing around without actually knowing how to solve the problem. They played with syntax and names and styles of tests without ever writing enough code to tell whether their tests were driving a design that would ultimately solve the problem. Following the GDCR, I held a coding dojo where I experimented with the format a little. I only had time to get the participants do two 45 minute coding sessions on the Game of Life problem. At the start, as a group we discussed the Game of Life problem, much as Corey recommends for a Code Retreat introduction. However, in addition, I explained my favoured approach to a solution – the data structure and algorithm I like to use. I immediately saw that they started their TDD sessions with tests and classes that could lead somewhere. I feel that if they had continued coding for longer, they should have ended up with a decent solution. Hopefully it would also have been possible to refactor it from one datastructure to another, and to switch elements of the algorithm without breaking most of the tests. I think this is one way to improve the code retreat. Just give people more clues at the outset as to how to tackle the problem. In real life when you sit down to do TDD you’ll often already know how to solve similar problems. This would be a way for the facilitator to give everyone a leg-up if they havn’t worked on any rule-based games involving a 2D infinite grid before. Basically, you hack around without writing any tests or polishing your design, until you understand the problem well enough to know how you plan to solve it. Then you throw your spike code away, and start over with TDD. Spending the first 45 minute session spiking would enable people to learn more about the problem space in a shorter amount of time than you generally do with TDD. By dropping the requirement to write tests or good names or avoid code smells, you could hopefully hack together more alternatives, and maybe find out for yourself what would make a good data structure for easily enumerating neighbouring cells. So the next time I run a code retreat, I think I’ll start with a “spiking” session and encourage people to just optimize for learning about the problem, not beautiful code. Then after that maybe I’ll sketch out my favourite algorithm, in case they didn’t come up with anything by themselves that they want to pursue. Then in the second session we could start with TDD in earnest. I always say that the code you end up with from doing a Kata is not half as interesting as the route you took to get there. To this end I’ve published a screencast of myself doing the Game of Life Kata in Python. (The code I end up with is also published, here). I’m hoping that people might want to prepare for a Code Retreat by watching it. It could be an approach they try to emulate, improve on or criticise. On the other hand, showing my best solution like this is probably breaking the neutrality of how a code retreat facilitator is supposed to behave. I don’t think Corey has ever published a solution to this kata, and there’s probably a reason for that. I have to confess, I already broke all the rules of being a facilitator, when I spent the last session of the Global Day of Code Retreat actually coding. There was someone there who really wanted to do Python, and no-one else seemed to want to pair with him. So I succombed. In 45 minutes we very nearly had a working solution, mostly because I had hacked around and practiced how to do it several times before. It felt good. I think more people should experience the satisfaction of actually completing a useful piece of code using TDD at a Code Retreat. 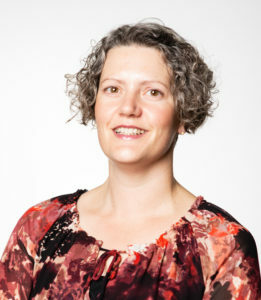 Posted by Emily Bache on 2011-12-20 at 14:00 under Coding Skills, Experience Report.